Winner of the SIVAL D'OR 2018, the Eclairvale MPP ® will be present at SIVAL ANGERS January 15, 16 and 17. The whole team of La Canne Vale is pleased to welcome you on the stand Hall C 121. The Eclairvale was marketed after 5 years of research and development, and its mode of action by free rotation is patented. Sleek designed and non-powered, the Eclairvale is a reliable machine. Flexible rods are the only wear parts, and they are replaced easily in less than one minute per rod. 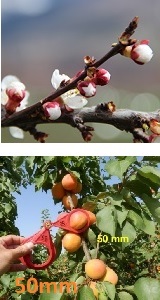 With flowers or with fruits, the thinning done by the Eclairvale compares with hand-made work. According to study reports (to download here : CTIFL 2018 / CTIFL 2017 / IRTA), the Eclairvale does not hurt trees nor fruits. It is to be used in the same fields and in the same season of your usual thinning... except that it's much more quicker. "The Eclairvale allows thinning of each orchard decided accurately, to the day, flower and fruit."